Vera & John Casino - happy, playful casino with a lot of great games and tournaments! 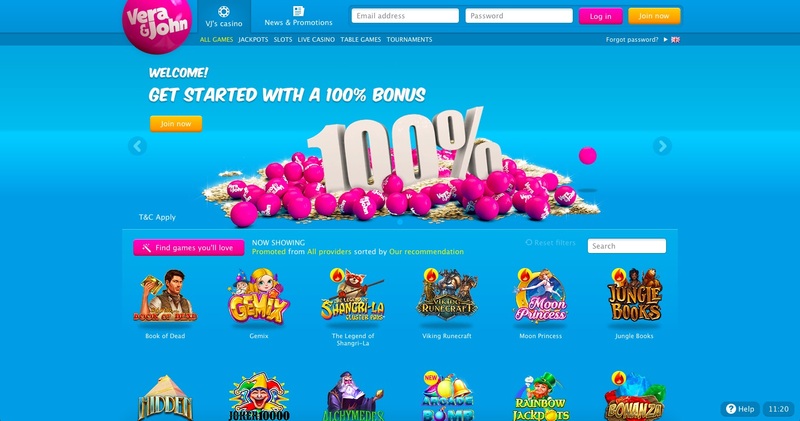 Among all the many UK casino online, there is one that is just a little bit special. This is of course the online site Vera & John Casino, or VeraJohn casino as they are often referred to. It’s an easy, nice looking and simple site with much fun to give their players. Games, jackpots, bonuses and a lot of excitement – it’s a complete site for anyone that wants to have really fun while playing at an online casino! This Vera&John casino review will tell you a bit about the casino, and what you can expect from it. We’ll try to give you a fair picture of the site. We really recommended you to visit the Vera&John casino by your self to get the right experience. It’s just as with any other UK casino, you need to experience it. It’s much better if you get to see the whole thing with your own eyes and experience it by yourself. The feeling and the experiences is something that needs to be felt first handed. A good first impression makes the whole player experience so much more fun! Vera&John casino has something that regular casinos haven’t. Of course, they have a lot of unique bonuses and a special experience, but there is also something else that makes the site different from the others. It’s of course their loyalty program in which you can collect coins, that has an internal value in the casino. You earn the coins by doing the most basic things in the casino – deposits, playing games, taking part of offers and such. They can be traded into a bonus or extra spins to use on the site. The coins will also help you increase in levels and climb higher and higher levels. The levels will give you different bonuses, offers and other nice rewards. Some activities that brings you coins are one-time only, such as registering at the site, get a display name and making your first three deposits. These are basically the things you would’ve done even if there weren’t a loyalty program, since they are very basic tasks. Getting a few coins for this is more or less just a huge bonus! Some activities are possible to do repeated times, such as monthly or bi-monthly. These are to log in a few times now and then, rating a game, play games, play new games and more. You can also get coins for adding a friend, making a small, medium or large deposit and when your friend deposits money. Also quite ordinary tasks that really doesn’t take too long. The reward is one step closer to a really good bonus or a Vera&John exclusive offer. Vera & John casino offers a lot of fun and excitement, as well as a generous welcome bonus to all new players! Enjoy the games in the casino with your 100% deposit bonus on your first deposit, and enjoy the fun even longer! The coins is not only an approval of you being a loyal player – it’s also a site currency which you can spend in the shop. Here you’ll find an arrangement of different rewards to buy, such as more extra spins and spin credits. You can use the coins as a way of playing and earning more coins, if you exchange them in the shop. There is also something called a bonus cup, which will give you a kind of deposit bonus once it’s full. This can give you a 25%, 50% or even a 100% deposit bonus up to £50. It’s a great way to get a little more to enjoy, and to have a bit more fun with your deposited money. The loyalty club fun does not stop there! You can also get a bunch of different badges as you complete certain tasks continues to be loyal. These is not only shiny – they are a way of getting even more Vera&John bonuses. The badges both proves your skills and dedication, and gives you a special treat once you get it. You get them once you reach a new level, and they all relate to different positions of the online casino. The goal with the badges is to create your very own virtual casino. You will also get a new avatar for every new badge you get. This avatar will grow alongside you in your casino adventure, and for every new badge there is a new avatar. The bonuses found at Vera&John casino are sure to give you a good start – as well as a pleasant following! The first Vera&John bonus is a really nice welcome bonus that really gives you a good start. Once you become a member and a registered player at Vera&John casino, you’ll get your 5 coins – easily earned! You will be offered more coins along the way, as we earlier described. Of course you’ll want to make a deposit of some kind, as you are to start your new adventure on the site. This is where the first deposit Vera&John bonus comes in – a 100% bonus up to a stunning £100. You surely will have a lot to play with after that – both your deposited money and the same amount of bonus money. If this bonus is not enough for you, and if you want even more – then you should know that they do have an ace in their sleeve. 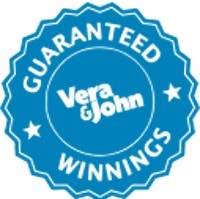 At Vera&John, there is a special guaranteed win for all the players. This is active both daily and monthly, and guarantee that at least one player will win a huge amount! The daily guarantee is that one player will win at least £10 000. If there hasn’t been a single £10 000 win or higher, Vera&John will simply top up the win to the player that scored the highest. This means that you won’t have to get a £10 000+ win in one spin yourself – you just need to get the highest one spins win of the day. Same goes with the monthly guarantee – if someone hasn’t won a £100 000 in one spins in a month, they’ll top it up. This also means that you can get quite a lot for just being a little bit more lucky than the rest of the players. And, you can be the lucky one more than once – maybe you’ll be the happy player to get topped up to a stunning £10 000 some day – or even £100 000! Being an online casino with focus on slots, Vera&John casino extra spins are found almost anywhere. Although, there isn’t any no deposit bonus, but the Vera&John extra spins are easily available anyway. You remember the coins, right? Well, these are tradable and you can exchange the coins for extra spins, or play credits. So, the coins is, in a way, both extra spins and chances which you can use to make bets in the live casino and similar. Use the coins in the Vera&John casino shop to get extra chances to win at the slots and games. It’s a great way to win a bit extra and maybe discover a few new slots, since some of the extra spins packages are only for certain slots. It you want more extra spins, simply play at the casino and be a loyal player, collect coins and buy an extra spins offer in the shop. Enjoy your spins and your earnings from them – simple as that! The games at Vera&John casino are of all kinds – old, new, exciting, relaxing, live, classic, interactive or simply just an old classic slot machine. There is a good bit over 200 games and counting, since there is always new releases from the many providers. The slots themselves are the main attraction for many and we really understand why. A lot to choose from, classic and new and all in the highest quality – the slots are really a reason on it’s own to play here! There is really a lot to choose from among the slots alone. A good half or more of the +200 games are slots in all shapes and forms, and you’ll surely find something you like there. There are games from a lot of different providers, which also makes a good and wide variety of games. A quick look gives us slots and video slots such as Gemix, Alchymedes, Moon Princess, Mega Fortune and Hall of Gods, just to mention a few of them. There is also a lot more, but there is so many that we simply can not list them all. We can say, however, that you will probably find the game you are looking for here at Vera&John casino! A lot of games from the same provider wouldn’t have been so fun, and there is a big risk that all games reminds more or less about each other. Vera&John casino already knows about this and that’s why they’ve made sure to get good collaborations with a lot of different software providers. They have games from developers such as Yggdrasil, NetEnt, Microgaming Evolution Gaming. There is also a lot more from developers both more and less famous. A lot of different developers also means a lot of different games, which also gives more joy to the players. We can almost guarantee that you will find something fun to entertain yourself with at the Vera&John casino if you are on the search for a game to enjoy a bit. It might be hard to find the games you are looking for among all there choices. The filter function is really a saver in these cases, and it really makes it all a bit easier. You can filter your games after qualities such as big wins, life changer and recent hits. You can also browse around in the hand picked games that is VJ favourites. There is also hot wins, tournaments, classic slots and much more. Well, it’s best if you go there and see it for yourself. It gives the most fair picture possible, and you get to try them all for free. Play the games for free before you decide to make a deposit and play for real. This way, you won’t have to loose any money on a game that you aren’t that excited about. Make sure to try the games out before playing for real money, and you’ll have a really great experience! The table games is of course here to, as well as the live casino. It might not be the biggest of all live casinos, but it sure does it’s job very good. Three card poker, black jack and roulette is only a few of the games that you will find here. There is also a lot more as well as a few different versions of the many games. This is really the place for the one that wants to play a classic casino game with a professional dealer. Are you interested in more unusual games? Well, Vera&John will not disappoint you here either. A few other goodies is also found in the casino such as scratch cards and video keno. You can also find games such as baccarat and poker games. They all have their own categories and are really easy to find if you use the category and game finder. Sort the games by what they contain, who made them or what you want to see. Find them all in a few clicks! You can also search the games very easily, to find the one you’re looking for directly. Play when, where and how you want with Vera John casino mobile as well! For the best experience possible, make sure to check in at Vera&John casino yourself. Maybe you find a new favourite game among the many kinds, or get one of those big wins. Remember the bonus which may make you a little bit richer by giving you a bit more to play with. Also, make sure to collect the coins by simply log in, playing and browsing around. They may not be money, but they sure might give you a lot anyway!